Falls is one of the seasons you can see the beauty of the falling leaves. However, the down part of it is that you will have to clean up piles of leaves from your yard. Disposing and composting them would be a hassle not to mention the fact that it may take lots of efforts. Fortunately, leaf mulchers are here to save your days. 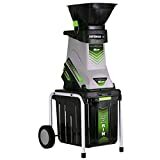 Not only they could help you shredding to the very fraction of each leaf, but they also save your disposal size which ultimately reduce the amount of bags used. We would like to bring you the best ten leaf mulchers and shredders for your reference. 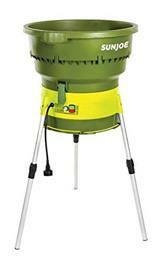 This Earthwise machine is sure both the leaf and branch eater. 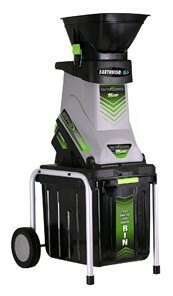 It has a very powerful motor working at 15 Amp to shred away leaf and branches up to 13/4 inches. The good part is that it comes with a collecting bin underneath the main shredder which stores all the shredded leaves and branches. 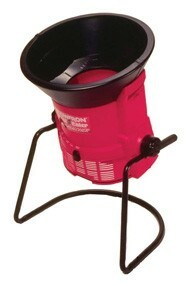 With this machine, you can save up to 10 times the storage space of your disposal. I would highly recommend this one if you are looking for the best budgeted leaf mulchers. It stands among the ones with the lowest price on its tag, while the quality is among the top ones. 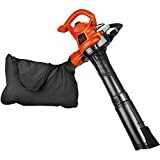 It operates on a 15 amp motor, with a speed of 4500 rounds per minutes, which is able to cut and shred leaves and wood branches up to a size of 1 5/8 inches. It is recommended to chop the limbs into straight pieces for a smooth and fast operation. 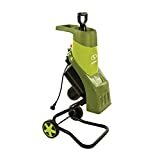 Similarly to the previous ones, this LawnMaster tool comes with a sturdy 15-amp motor, and it also works both with branches and leaves. It has a 10:1 mulch ratio, which means if you have ten bags of leaves, you will end up with only one bag of leaf fractions. The design allows you to quickly gush the particles through the top, leaving the front part for you to collect the debris into a bag. There is a safe push stick included. Work in a green way by turning your yard waste into nutrient-rich organic compost that helps fertilize your garden needs. 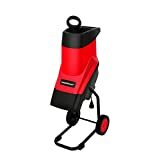 It is the perfect helper for chipping, shredding, and mulching. With the triple action cutting system, it ensures and all-the-time satisfying results. Safety is the priority. It comes with an overload switch that activates when there is a jam. 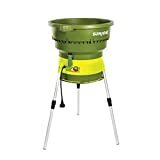 It is now time to tidy up your yard, turning the unwanted yard waste into rich nutrient for your garden with this Sun Joe chipper and shredder. The assemble takes almost no efforts with every needy tool comes ready in the box. 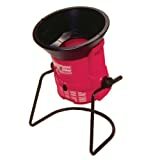 With the 14 AMP power machine, this Sun Joe cut through brush, leaves, branches, twigs, and most other sorts of yard wastes into their smallest fractions. The best part of this mulcher is that it reduces the amount of waste at a 16:1 ratio. 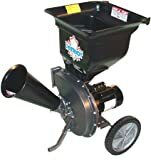 When yard chores seem to be overwhelming, let’s ease up yourself with this Sun Joe Leaf Mulcher. 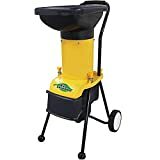 Designed especially for leaves, this machine mulches up to 12 gallons of leaves per minute with a potent 13AMP motor at 8000 RPM. That is incredible speed. You can also control the speed with a dialer setting for dry and wet leaves. The machine reduces a significant amount of waste, from 16 to 1. With this Flowtron leaf mulcher, you can now transform your leafy backyard into a smooth showplace with minimal efforts. Imagine, piles of leaves from the trees around your house that require you to clean up and put them aside. It could be very tiring. Fortunately, this machine helps you turning a full-day work into just a few hours while also reducing the dumping size. The particular part about this mulcher is that you can adjust the angle, 180-degree max, matching your standing position, and it amazingly has a 30:1 particle size-reduction. 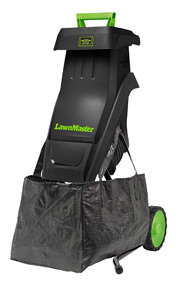 Look at this sleek electric leaf mulcher! Not only does this product offers the lowest price among the leaf mulcher, but it also grants its user with high satisfaction. It can mulch up to 53 gallon of leaves per minute which is the most noticeable amount of intake we have seen so far. This would mean you can work much quicker than any other leaf mulchers available. If you are looking for a fast worker, this is the ideal one recommended for you. 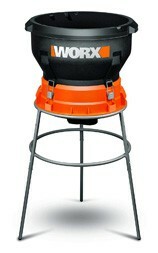 Here is an ideal product if you are a type of working on the go. All the previously reviewed products require you to have at least a pile of yard waste ready to be swallowed by the machine. With this one, you can wander around your yard and pick them off. However, this is going to be a problem if you have a too big yard. Besides mulching, this tool is also a blower and a vacuum. 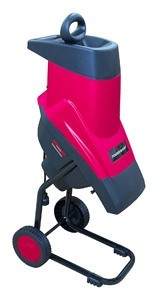 Best product of the year goes to the professional-grade wood chipper and leaf shredder, the Patriot CSV. It flawlessly chips and mulches its prospects into microscopic particles practical for the compost productions. This machine offers to crack through the biggest branches up to two and a half inches, which is second to none of its kind. I would highly recommend this for a larger yard. In a quick summary, let’s not waste our efforts working on manually shredding the yard waste. It is a one-time purchase while you can work on it for seasons. Moreover, there is not much price on the tag. 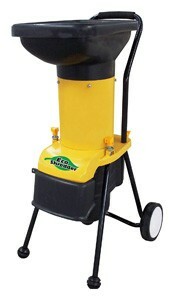 Pick the best one for your yard type and always keep an eye on the cutting power, portability, and durability.